Principal Strickland might have told Marty McFly he lacked discipline in Back to the Future. But, Olentangy Orange girls volleyball coach Katie Duy wasn’t saying that about her team … not after Tuesday night’s straight-set victory over visiting Olentangy Liberty to opened OCC-Buckeye play. The Pioneers used a 17-5 start in the opening set to boost them to a 25-15, 25-19, 25-23 victory in Lewis Center, handing rival Liberty its first loss of the season. Sophie Dahn opened with an ace and Megan McCollum added two more in Orange’s 10-2 start before extending the lead as high as 12 on its way to a lopsided first-set victory. The Pioneers finished with 7 aces as a team, led by Carrigan O’Reilly with 3 and Dahn and McCollum, who each had 2. London Davis led with 11 kills, Gossard had 7 and Madison Moll added 6. O’Reilly had 29 assists and 3 blocks, McCollum had 19 digs and Dahn finished with 14 to lead Orange (5-1, 1-0). Liberty grabbed leads early in each of the next two sets, including a 9-4 lead to start the third frame. But, Orange had a response each time. “When we were passing well and able to run our middle, I didn’t feel like they were able to keep up with our pace,” Patriots coach Jen Chapman said. 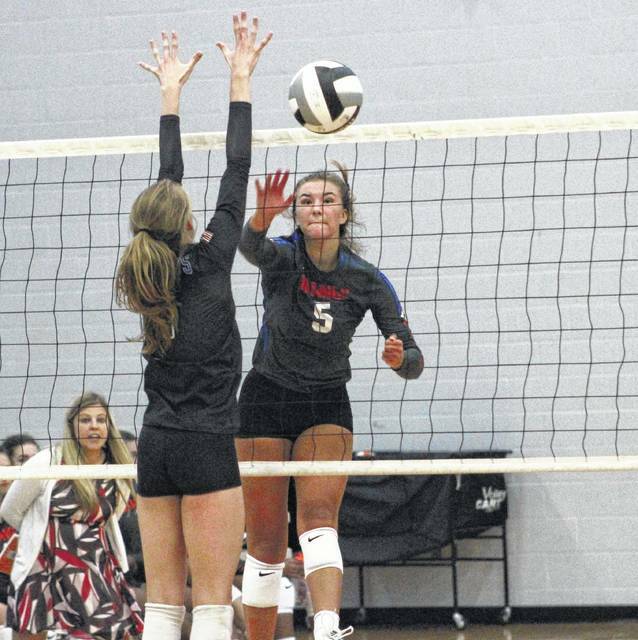 Claranne Fechter had 8 kills and 10 digs, Cameryn Dyer had 10 digs, Maddie Fogg had 28 assists and Abby Erickson had 6 blocks to go with 7 kills to lead the Patriots. Grace Clark had 6 kills and Taylor Karlo added 5 for Liberty (6-1, 0-1). Next, both teams continue league play Thursday at 7 p.m. Liberty hosts Westerville South while Orange visits Westerville Central. Orange’s Sidney Gossard (5) hammers the ball past Liberty’s Claranne Fechter (1) during Tuesday’s OCC showdown in Lewis Center. The Pioneers won in three sets.